(NaturalNews) With the stroke of a pen, President Obama has now set America on the path toward open rebellion and revolt. By declaring that he alone has the right to dictate immigration policy without the legislative approval of Congress, he has committed yet another lawless act in a long series of illegal schemes that cement his position in history as nothing more than a sociopathic liar and destroyer of nations. The liberal media won't report this, but Obama has just crossed the line in the minds of tens of millions of Americans and their representatives in Congress. This President has gone from merely being "deceptive" to being thought of as an outright criminal who must be restrained to save America from tyranny. There will be public calls for his arrest and prosecution. There will be revolts, both political and on the streets. You will see attempts to march on Washington and "throw the bum out" of the White House. The era of all-out revolt and rebellion is now upon us. Again, another reference to revolution and rebellion. What Buchanan recognizes is that Obama hasn't merely done something politically disturbing; he has done something that shreds the very fabric of political balance in America. Obama has just declared Congress to be null and void. And in nullifying Congress, he has simultaneously given the finger to every man and woman in the nation, telling them that their own voices and representatives in Congress are utterly irrelevant. The actions I'm taking are not only lawful, they're the kinds of actions taken by every single Republican President and every single Democratic President for the past half century. And to those Members of Congress who question my authority to make our immigration system work better, or question the wisdom of me acting where Congress has failed, I have one answer: Pass a bill. [Obama's] speech represented a closely-woven and incredible tapestry of falsehood, exposited with a straight face by the greatest liar in modern American history... To those versed in immigration and constitutional law, watching Obama lay out his program felt like watching a madman describe, with preternaturally perfect sincerity, how the moon was constructed of cheese: you know the argument is untrue, but it's incredible to watch its dogged exposition." I have been warning readers about the rise of tyranny in America for more than a decade. Now the era of in-your-face lawlessness and tyranny is here, and it is celebrated by delusional left-wing denialists who have no grasp whatsoever of history and how nations rise and fall. 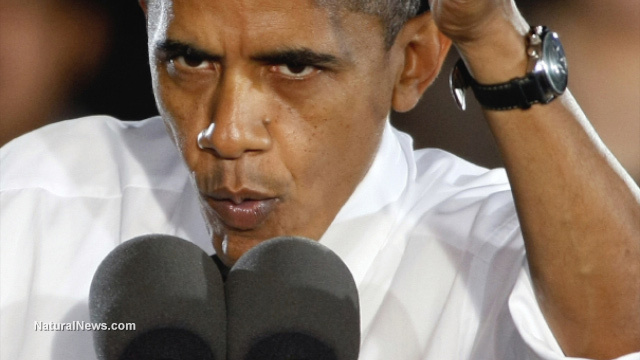 Obama has put America on the path toward "open rebellion," revolt and civil war. Such scenarios usually do not reach a conclusion without bloodshed, sadly. Recognize right now that we may all be living in the last days of the American empire. We might narrowly avert it if those of us who still believe in the Constitution, justice and liberty manage to demand lawful restoration of this nation's Constitutional foundations and take America back from the corruption and tyranny that the Obama administration has cast down upon us all. It is time to rise up and call for impeachment. It is time to take to the streets in non-violent protests, and then march on Washington by the millions, to send a message that lawless tyranny will not be tolerated in the "Land of the Free." And yet, even as the severity of the situation now demands mass action in the name of saving America from domestic political traitors, I cannot help but observe that most Americans are too obese, too fluoridated, too medicated and too apathetic to do anything other than reach for the TV remote with one hand and another bag of MSG-laced Doritos with the other. America may have already become too diseased, too confused and too mentally suppressed to rise up against anything... including a self-declared psychopathic dictator who will truly go down in history as one of the most malicious and destructive liars ever recorded.